Over the past thirty years, the world's patent systems have experienced pressure from civil society like never before. From farmers to patient advocates, new voices are arguing that patents impact public health, economic inequality, morality--and democracy. These challenges, to domains that we usually consider technical and legal, may seem surprising. But in Patent Politics, Shobita Parthasarathy argues that patent systems have always been deeply political and social. To demonstrate this, Parthasarathy takes readers through a particularly fierce and prolonged set of controversies over patents on life forms linked to important advances in biology and agriculture and potentially life-saving medicines. 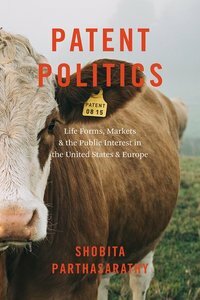 Comparing battles over patents on animals, human embryonic stem cells, human genes, and plants in the United States and Europe, she shows how political culture, ideology, and history shape patent system politics. Clashes over whose voices and which values matter in the patent system, as well as what counts as knowledge and whose expertise is important, look quite different in these two places. And through these debates, the United States and Europe are developing very different approaches to patent and innovation governance. Not just the first comprehensive look at the controversies swirling around biotechnology patents, Patent Politics is also the first in-depth analysis of the political underpinnings and implications of modern patent systems, and provides a timely analysis of how we can reform these systems around the world to maximize the public interest.